Welcome to the How to connect to Google Analytics tutorial. This tutorial aims to give you an overview of the Google Analytics connector and to touch on some high level concepts such as how to authorize access to Google Analytics and how to define a query. 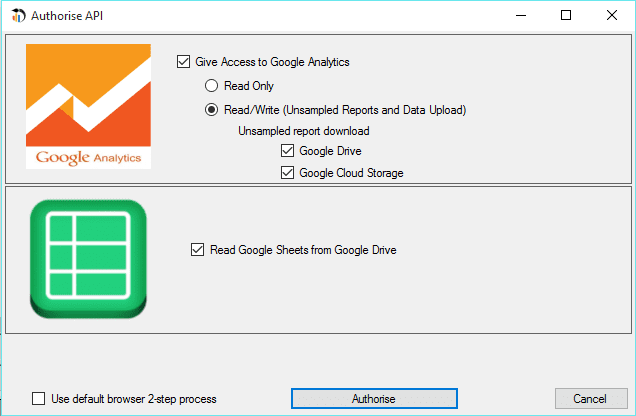 Before you connect to your Google Analytics data, you must authorize Analytics Canvas on your computer to access the data. You will be requested an access when you run Analytics Canvas for the first time. You can also authorize Google Analytics access from the Accounts menu, by selecting “Authorize New Account” and then “Google (GA, Sheets)”. Select the level of access you want to authorize, from the following options: Read Only, Read and Write, and Read from Google Sheets (Google Drive). Analytics Canvas will redirect you to Google’s website, where you can log in with your credentials and grant the permission to Analytics Canvas to access your Google Analytics data on your computer. You can authorize multiple accounts and switch between them in the menu. Note: You can revoke Google account access within your Google account settings at any time. Step 1. Select “Google Analytics” from the New Source menu and then click on “Core Reporting”. Core Reporting contains most available dimensions and metrics, including Sessions, Visits, Pageviews, Events, Goals, Custom Variables, Ecommerce data and more. Step 3. 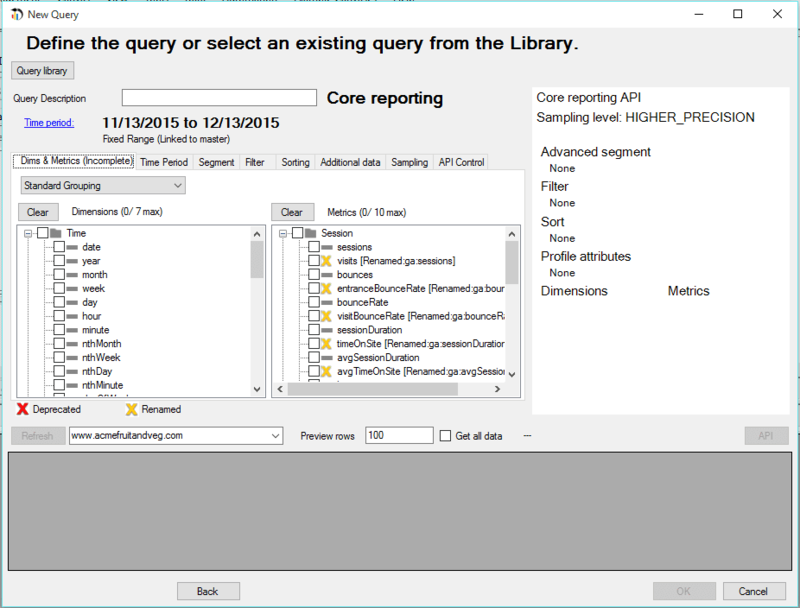 Define the query by selecting dimensions and metrics, and specifying a time period for which you need the data. You can also apply segments, filters, and sorting, get additional data, such as Account ID, and choose how you would like to get the data in Sampling and API Control tabs. Step 4. Name your query and click OK.
Analytics Canvas will create a new Google Analytics import block on the Main Canvas.